Family Ties on Kindle… for $2.99! So I’m extremely busy these days with a big work-for-hire project that I’ve been asked to write along with a mammoth creator owned book that is taking up a lot of my time, but I wanted to drop by and quickly let everyone know that Amazon has made the digital version of Family Ties one of their “Monthly Deals” in July. This is really cool as most the books they include in the monthly promotion are novels. There aren’t a lot of graphic novels selected so it was kinda nice to see FT get some love. And what does that mean for you? 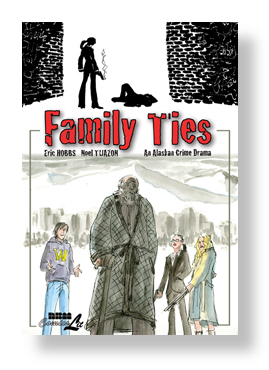 Well, if you have a Kindle (or the Kindle app) you can get Family Ties for just $2.99. That’s almost 180 pages of story for less than three bucks! I can’t imagine you’ll ever have a chance to get it cheaper. Author Eric HobbsPosted on July 1, 2014 Categories Blog, New ReleasesTags Amazon, Eric Hobbs, Family Ties, Kindle, Noel TuazonLeave a comment on Family Ties on Kindle… for $2.99! Family Ties: the word is out! So it’s been about since the release of Family Ties and the response has been great. Thanks to everyone who’s picked up a copy, especially those who stopped by and saw Noel and I at TCAF last month. Not many people have a book signed by both of us. Hoping to secure a future for his children, an aging Alaskan crime boss looks to retire and divide his empire amongst his three heirs. But when his idealistic son refuses the inheritance, the old man disowns him. This turns out to be a fatal mistake when he sees his cold-blooded daughters use their new-found power and influence against him. Inspired by the classic play KING LEAR, THE GODFATHER meets Shakespearean tragedy in this epic tale of betrayal and loss. Author Eric HobbsPosted on June 4, 2014 Categories Blog, New Releases, ReviewsTags Eric Hobbs, Family Ties, Noel TuazonLeave a comment on Family Ties: the word is out! Obviously any drama that’s focused on a the members of a crime family is going to be influenced by The Godfather. The Godfather is one of richest stories to ever be told so it only makes sense that I drew on my love for those movies when writing Family Ties. One of the most memorable scenes in The Godfather is the wedding that opens the first movie. Most the people at the wedding have no idea Don Corleone is conducting “family business” in his office. As a kid, I thought is was great that that was going on right under everyone’s nose and jumped at an opportunity to include something similar in Family Ties. The first is easy: I used to live there. Just as The Broadcast takes place in my backyard of Indiana, Family Ties takes place in a locale I know well. I spent most of high school and my first year of college in a small town just outside of Anchorage. Just like Indiana, Alaska played a huge part in my life and is still the place I think of as “home.” There’s an old saying that authors should “write what they know.” Well, other than worlds of my own creation, I’ve never known a setting better than the two used in these first books with NBM. Beyond that, Alaska is a great location for any story. But it’s particularly good for crime. Sound crazy? Well, stay with me. You see, the sixties in Alaska were a wild time. The closest thing to the Wild West since… well… since the Wild West. The oil boom brought people to Alaska in droves. They were promised a good living, and that’s exactly what a lot of them got. The city’s population exploded with hardworking men and women who suddenly had money to spend. But here’s the rub — unless you’re an avid outdoorsman, there isn’t a lot to do in Alaska, especially come winter. Luckily, criminals were there fill the void. Gambling, prostitution, drugs — they were all prevalent in those boom years. In fact, there’s a great non-fiction book called Johnny’s Girl by Kim Rich that details the Anchorage underworld in the 1960s that I can’t recommend enough. Author Eric HobbsPosted on March 3, 2014 Categories Blog, New ReleasesTags Eric Hobbs, Family Ties, Noel Tuazon, The BroadcastLeave a comment on Family Ties: Why Alaska? More than anything, Family Ties is a book about the deterioration of a dysfunctional family. But as the finished art rolled in: to be honest, I was a little taken aback by just how much action there actually is. I know I wrote the thing, but I think I’d forgotten that (true to the Shakespearean play it’s based on), Family Ties turns into quite a bloodbath near the close. It’s pretty safe to say, if you’re a fan of violent crime stories — there will be something for you too. There’s a lot of family drama that unfolds early, but eventually that turns to gunplay. Here are a few preview pages to give you a sense of what I mean. I hope everyone can appreciate just how great the final panel in that last preview page is. Noel absolutely killed it on this book. I can’t wait to share it with you guys! Author Eric HobbsPosted on February 1, 2014 Categories Blog, New ReleasesTags Eric Hobbs, Family Ties, Noel TuazonLeave a comment on FAMILY TIES: Action Packed? Well, we’re almost there. It’s been a bit since I updated the blog with news that Family Ties was delayed, but I’m excited to say that we are almost there. Noel has finished with the artwork and our letterer, Jaymes Reed, is making his pass over things now. I’ll be stopping in occasionally to remind everyone why we’re so excited for this follow-up to The Broadcast. Until then, I thought I’d offer proof that we’re about to cross the finish line: the book’s final page. It’s spoiler free (as spoiler free as an adaptation of Shakespeare can get, anyway). That said, there was a time when this page seemed a thousand miles away so it’s kinda nice to see. Not to mention, gorgeous. I think everyone is going to love what Noel did with this book. It’s the best work I’ve ever seen with him — but, of course, I’m a little biased. FAMILY TIES is an Alaskan Crime Drama. Hoping to secure a future for his children, an aging Alaskan crime boss looks to retire and divide his empire amongst his three heirs. But when his idealistic son refuses the inheritance, the old man disowns him. This turns out to be a fatal mistake when he sees his cold-blooded daughters use their new-found power and influence against him. Inspired by the classic play KING LEAR, THE GODFATHER meets Shakespearean tragedy in this epic tale of betrayal and loss. This shouldn’t surprise anyone, really. After all, Noel and I already did a book about an alien attack without any aliens in it. The Broadcast was a character-driven thriller about families in rural America and how they might react to an alien invasion. The aliens (or lack thereof) were just a catalyst for the story Noel and I wanted to tell. Family Ties is no different. The crime stuff is there to serve the story we want to tell about this dysfunctional family.